For many B2B marketers, LinkedIn can prove to be a figurative and literal pot of gold. 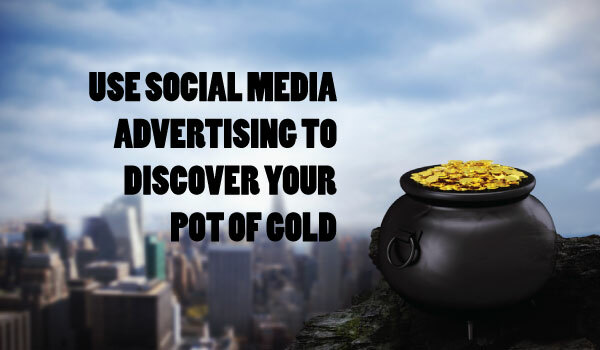 While there’s no majestic rainbow to show you the way, I can show you how to incorporate social media advertising as part of your LinkedIn Marketing strategy. A few years ago, HubSpot surveyed B2B organizations and found that 65% of them reported that they have acquired a customer by using LinkedIn and its paid advertising features. Many organizations have found LinkedIn users to be incredibly receptive to seeing ads and sponsored updates within their feeds. Because LinkedIn is professionally focused by nature, users expect to be having conversations about business. The best practices below provide some helpful insights into LinkedIn paid advertising basics and can help drive the performance of your campaigns. In our experience, sponsored Updates drive much higher engagement than LinkedIn Ads for the majority of the clients we work with. Below is a sample of conversion rates for both sponsored updates and LinkedIn Ads. Why is There Such a Gap in Conversions? Sponsored updates appear in the users news feed, which makes them hard to miss. Ads however, appear within the right hand column and can be easily looked over. A sponsored update is only noted by small gray text that says “Sponsored” if not looking closely, users may not even notice that they’re clicking on boosted content. Sponsored Updates give the marketer much more flexibility with messaging and imagery compared to ads that have much stricter guidelines. LinkedIn Ads have their place within a social advertising strategy and can often help marketers meet their hit their fiscal goals. However, if you’re just starting out and want to get the most out of your marketing dollars, we recommend focusing your efforts on sponsored updates. LinkedIn has an entire suite of targeting options for you to choose from. If targeting is too broad, your messaging will lose its effectiveness. 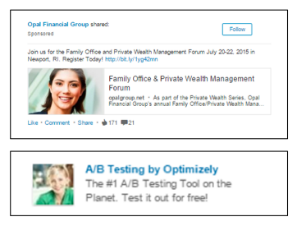 We always recommend testing different types of targeting within your LinkedIn campaigns. For example, you can test targeting by title, then grouping. Alternatively you can target by group and then title. Our clients have seen a great deal of success by targeting specific titles within groups, as well as targeting titles within specific companies. The bottom line, experiment with your targeting to find the best mix for your audience. Be social, be interesting and be conversational. Sometimes you may have to remind yourself that users flock to platforms like LinkedIn because they add a social element to their personal and professional life. The messaging used in sponsored updates and ads should focus on your target’s problem and the solution that you offer to meet their need(s). Your prospects may not care about your new eBook or whitepaper, but they will care if your content helps them solve a business problem. Remember to always create content that speaks directly to your audience. Messaging for a CEO should be different from that for a Manager or Consultant. That’s the beauty of LinkedIn; you have the opportunity to be the answer to all of those unique questions, so tailor your answer/solution accordingly. You only have 160 characters for direct sponsored posts, so make sure your CTA or your primary takeaway is front and center. Rule of thumb, if you have an alternative to stock photos, use it. LinkedIn is filled with stock imagery so creating images that are unique, bright and energetic will go a long way. Your imagery should be used to support your content. In the first image below you can see that the visual used of IBM and Facebook clearly aligns with the message of their partnership. The two images on the right however, don’t particularly match up to the message that is being promoted. Be sure to update your messaging and imagery frequently. We typically recommend that messaging is adapted every couple of days. Your audience will gravitate towards different messaging and images so I will typically launch new campaigns as opposed to revising existing so we can keep track of which messages work best. We always recommend using some sort of download as your CTA. A demo or meeting may be your ultimate goal but from an engagement standpoint, a download always wins hands down. It’s easier asking for that demo once they’ve gotten the information from you. As you can see below, we have typically found that downloads have a much higher conversion rate than demos. Your daily budget should be dictated by your audience and the bids that LinkedIn is recommending. If you apply the lowest bid acceptable, it will greatly reduce the number of impressions your campaign will be severed. If you feel that your activity is low, that normally means your bids are too low. Be mindful that success with LinkedIn sponsored posts and advertising takes time. If you know your audience and can be nimble in your approach, your chances of success will greatly increase. If you’ve used LinkedIn advertising in the past, what were the biggest lessons that you learned? Disclosure: LinkedIn is a TopRank Online Marketing client. Am really glad that I saw this article at this moment in time because I am in the process of planning a Linkedin marketing campaign. Your post has given me a good basis to start, so i am a lot more confident about the journey ahead. Thanks again.